This is a popcorn kernel. 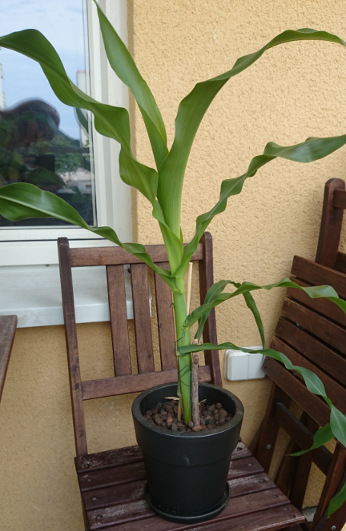 Two months ago, my daughter brought me a kernel very much like this one and asked me to plant it. I look at this kernel now and cannot help but ponder how something so small can reach such great heights. 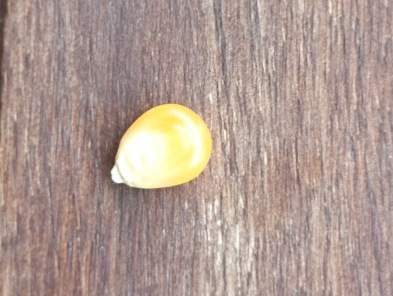 This tiny, amber-colored kernel, no bigger than my fingertip isn’t very exciting. It sits there, for hours on end, waiting for something to happen. Maybe that’s nice for some people. After all, it doesn’t talk back. It doesn’t whine. It doesn’t complain. It doesn’t bark at every stray cat that walks through the neighborhood at least five miles away. Then again, it also doesn’t encourage. It doesn’t smile at you, or embrace you. It doesn’t dance. It doesn’t touch a life. It doesn’t DO anything. It sits there, passive and silent. Each of us has a dream hidden deep within us. Dreams of performing on Broadway! Scaling Mt. Kilimanjaro! If you’re afraid of heights, maybe your dream is something a bit calmer like beginning a flower arranging business, starting your own Bed and Breakfast, traveling the world, painting until your soul weeps, or writing a book. Just like that popcorn kernel, though, we all have one. Keep the dream secret, if you wish, but don’t deny its existence. 1) Toss it out. How many popcorn kernels have you picked up from the floor and tossed in the trash? How many of us treat our dreams the same way? They have fallen to the ground, lost and forgotten. Or perhaps someone ripped them from our hands and ground them into the dust with their boot heels. If we’re lucky enough to find them again, they’re so battered and ugly we shuck them in the garbage with the other broken bits and pieces of our lives. I think we all do this. We toss out little dreams, and sometimes big ones, because we’ve been hurt, or someone else has stomped all over them. We pick them up, much as we pick up that kernel, and look at all the dirt. The luster is gone, the shine faded away, leaving it covered with the grime of every day life. Or worse–we look at our once lovely dream and see the impossible. Finally, we blink away a tear and resign ourselves to our fate. In our pain, surrounded by the busyness of endless tasks, pointless running around, social media comas, and everything else that makes up our lives, we decide it’s not worth it. 2) Shelve it. Millions of dreams must be sitting around waiting on abandoned shelves, or sometimes well-dusted ones. This is almost the same as the first choice, the only difference is the preposition used. In the first choice we toss the dream in the trash, for this choice, we toss it on the shelf. The result is almost always the same, with one small exception: If you’ve shelved your dream, there is still a chance to go get it. 2) Pop it! That’s what popcorn is for, right? Mmmm! With a little effort we soon have a piece of fluffy, buttery goodness to toss into our mouths. If you’re really good, you can catch it in the air. Some of us fall into this trap. We put forth a little effort, maybe even add a touch of flair to it. We spend an afternoon painting a sunset, or writing a short story. In a burst of inspiration we remember our grandfather who was a master whittler and we decide to take up woodcarving. One starter kit later, we have a skinny block of wood that almost resembles a square stick with notches. Unlike the first choice, we have been productive. We follow the dream! Three steps to the microwave. We pop that warm ball of white puffy corn into our mouth, declare it yummy and call it a day. There’s nothing wrong with this choice, per se. I’ve done it before. Keep in mind, though, when you sell out your dream, you’re the one who has to answer for it. Oh, and a word of caution: Dream ghosts pop up at the most inconvenient times. Difficult to find an exorcism for them, too. You have been warned. 3) Plant it. This is my favorite, but it takes the most work. It takes patience, constant attention, watering, dedication, and most of all, it takes perseverance. Because unlike the third choice, the rewards aren’t available immediately. If you’re patient though, if you devote time to your dream, you’ll wake up one day and find something bigger than you had ever planned. That little tiny popcorn kernel has grown into a corn stalk that won’t settle for anything less than dancing in the clouds. If I’m honest, I’ll admit I didn’t expect that kernel to fulfill its dream. I’m not sure I ever even thought about it before. Can you tell I was the doubter by the painstaking care I put into selecting the right pot? But you know what? I don’t want to be the doubter anymore. I want to be not only the sower and caretaker of my own dreams, but also a cheerleader for others. And so for all the dreams out there I never believed it, I’m sorry. For all the people I didn’t believe in, I ask forgiveness. I encourage you to go pull your dreams off the shelf, or rekindle them in your heart and plant them. No matter how small and simple you think it is, that dream just might touch the sky. Ask the popcorn kernel if you don’t believe me. If you need support, I’ll be right here, cheering you on.